If you’d like to reach me, just send an e-mail to Angela-at-AngelaConnor.com or type a message in the box below. You can also call me at 919-374-0627. If you are inquiring about consulting services or would like to hire me, please fill out this form and I will contact you within 24 hours. You can also view this one-sheet for details. 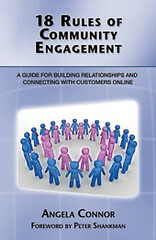 If you’d like to interview me about my book, please see the Media Kit for 18 Rules of Community Engagement. Can i have your e-mail address? I need it for my database. Thanks.